and applies to become a barista. Yes, 8 years of teaching behind me and an education degree under my belt, and I wanted to serve coffee. The bat headband aside (Hey, I had to work that Halloween & I was getting in the holiday spirit. ;) ), I have a big ole grin plastered on my face in this photo. I enjoyed the job. It didn't pay much, and I didn't need a college degree to work there. 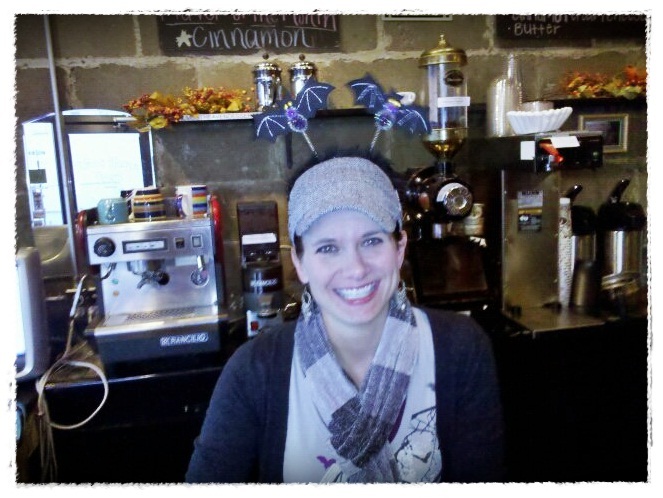 But I really liked my little four month stint as a barista at the only local coffee shop in my hometown. I really liked my regulars. I took pride in my lattes and espresso pours. I am glad I could add milk steaming/frothing, espresso pours, cappuccino/latte making to my culinary skills set. And now, I make some mean lattes at home with my own espresso machine. I'm a teacher and I always tell people when I retire I want to work at Starbucks:) I don't know what it is about learning all the drinks that is so appealing. One of the hardest jobs is working retail of any kind. I seriously think it makes for better people. I think it's so cool that you were a barista, plus you can now make your own drinks at home! Hope your weekend is great! 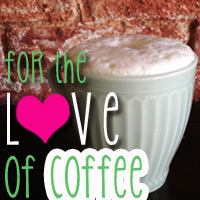 Hey there lady, visiting you from the FOR THE LOVE OF COFFEE link up. Thanks for joining us and fingers crossed you win the awesome prizes!